Participants and students at work during the digital inclusion sessions at Southam. 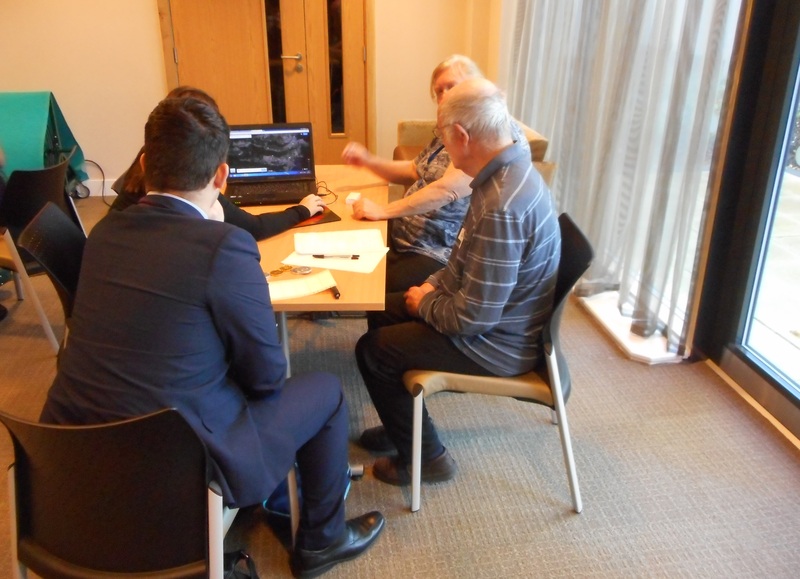 Back in March, we ran a digital inclusion project at Briar Croft, Stratford. The results of that project can be found on this website, with a fair few articles coming from it. These range from Muriel’s joy at finding out some more information about tunnels under Stratford, to Irene’s memories of being evacuated from Birmingham to Stratford, to a more modern (if still historic!) account of the formation of Shottery Rugby Club. These, of course, are the lasting responses, but what we also ended up with was a sense of community. Now, obviously at this stage I speak about the community during the sessions – the joy of sharing with each other, and the Sixth Form students who helped the over 55s tell their stories. Following on from the success of these sessions in Stratford, the project was recommissioned, this time to run at Tithe Place, in Southam. It’s the individual stories that makes things worthwhile, and by that I don’t just mean the stories that go on to the website itself. I can think of one gentleman, in particular, who is enjoying the sessions and enjoying the opportunity to recall happy times. You’ll be able to spot his tale a mile off when it gets onto the website, as it involves much globetrotting, yet always returning to Southam – it’ll be another Warwickshire story involving sailing ships! And, once again, we have help from sixth formers – this time from Southam College. Numbers expanded greatly after the first session, so it’s clear that they get something out of the experience of speaking with others about the past. As one remarked to me, ”it’s a chance to show that not all teenagers are mindless thugs”, and that’s abundantly clear (as if it needed spelling out!) in these sessions. Community is what it’s all about, both online and offline. Now if you’ve read this far, then you’re part of this online community so, if you feel motivated to comment on any of the articles or add to the knowledge and stories already on show, then do please join in. These sessions are an intergenerational digital inclusion project, in conjunction with Orbit Heart of England, with the assistance of students from Southam College.